Another beautiful summer day with highs near 80. Gert continues on a breakneck pace across the North Atlantic as it heads across The Grand Banks of Newfoundland. Meantime, here at home, high pressure builds in for another beauty on Thursday. Gert is being sustained by a strong jet stream - the same that is giving us a gorgeous day today and hastening the arrival of showers Friday. Loving the look of the temps today: few degrees cooler than Wednesday with a gentle sea breeze at the coast. For beachgoers, the waves are still rough and frothy. Rip currents could still be an issue, but they should be less intense as Wednesday. Showers are on the move tomorrow. They could jump on us early as a warm front crosses New England. In the spirit of the old saying "move 'em in, move 'em out", the prospect of a wet Friday bodes well for the weekend forecast. Saturday doesn't seem so bad with the shower activity looking spotty and focused on the afternoon. Sunday returns to the heat and thicker air. Humidity won't fire up thunder, however as the atmosphere stabilizes under a new high pressure system. This one has staying power too. Should keep us in the sun and heat through the middle of next week! 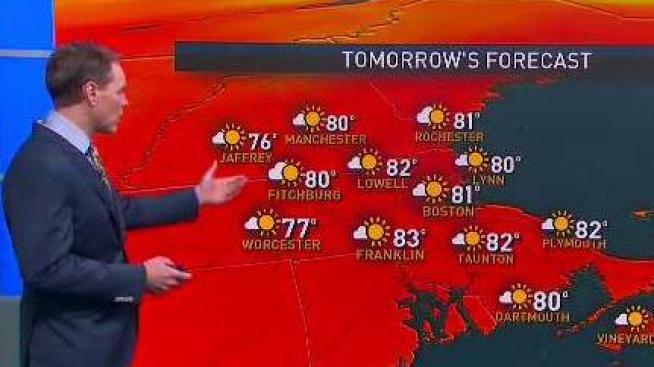 Someone may even touch 90 degrees Monday or Tuesday. Despite the shortening days, summer is hardly over.